Old Dutch Decor Copper Hammered Rim Charger Plate 13"
Home > Products > Old Dutch Decor Copper Hammered Rim Charger Plate 13"
Set a charming and inviting table with the Old Dutch Decor Copper Hammered Rim Charger Plate 13". 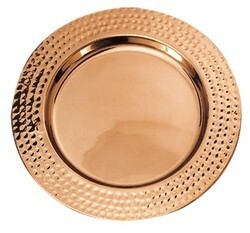 Accented with a hammered border and copper plated finish, this product provides a brilliant backdrop for stunning dinnerware. This highly durable piece is made from lustrous metal that shimmers with sophisticated warmth. Designed for aesthetics as well as functionality, this charger also protects tabletops against spills and mess. Suitable for weddings, formal affairs, and upscale dining, this charger plate can also be used to create eye-catching centerpieces.